Every now and then, I like to see theatre that will amuse me. Pure and simple. Bad Habit Productions, a My Theatre Award winning Boston company, delivers solid production after production. Their latest show is an original adaptation of one of the Bard’s finest comedies. Their William Shakespeare’s Much Ado About Nothing . . . With a Twist is a magical and joyful romp into the merry world of romance, mistaken identities, and a bit of cross-dressing. 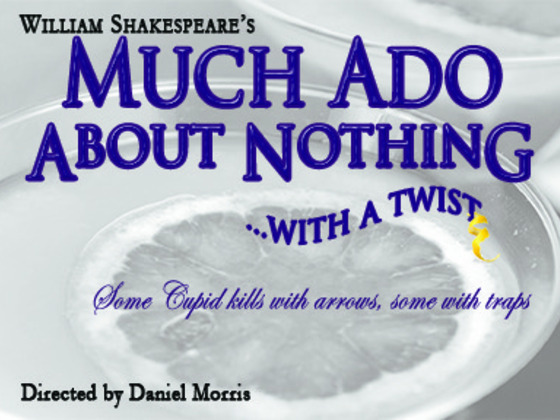 Yes, you heard that right, this production of Much Ado About Nothing goes there. This adaptation is clever, thought-provoking, and, most of all, accessible to any audience. I think this accessibility and easy is what I enjoyed most about this production. The cast and crew’s journey into the difficult world of Shakespeare seems effortless and their skill and joy in putting on this production is where the magic really happens. Daniel Morris, a seasoned director for Bad Habits Productions, adapted and directed this marvelous reimagining of the classic tale. I knew I was watching something different as early as the opening prologue. The original does not feature the prologue and, in any other production, would function perfectly well without it, however, this adaptation thrives on the delightful and thrilling introduction to the magical world of Beatrice and Benedick. From the music to the dancing to the clever introductions to the many characters, including their dynamic and changing relationships, the audience quickly learns the major characters, but more importantly, the audience learns just how fun this production is going to be. This adaptation features five very talented actors who play no fewer than fifteen parts among them, changing costumes with a blink of an eye. Costume designer Pamela DeGregorio does marvelous and daunting work in this production, making a Hero dress for every character (plus a mannequin) while making numerous quick-change-accessible costumes for over fifteen characters. While I wasn’t in love with Beatrice’s dress, the floral pattern grew on me, and softened Beatrice’s tone throughout the play. Sasha Castroverde’s Beatrice is captivating. She is a stunning actress to watch and I loved the fine line she walked between a Taming of the Shrew Kate and a Love’s Labour’s Lost Rosaline. Beatrice is a difficult “old maid” to conquer and Castroverde surpassed expectations. She further awed the audience with her range and flexibility in her other four supporting roles. Castroverde is a versatile actress who conquers Don John with melancholy and unease, Friar Francis with piety and poise, Seacole with ambition and gumption, and Hero with daintiness and charm. She makes every moment onstage a spectacle and thrill to watch, adding to the production’s magic and charm. Unfortunately, I can’t say the same for Seignior Benedick, played with earnest by David Lutheran. His Benedick is a man’s man, with boisterous laughter and thoughtful prosing. But that is where Lutheran gets hung up. He enjoys the comedy so much that I didn’t get the grounded nature of Benedick; for him, marriage, like the world, is a joke. A large part of my concern with his casting as Benedick is how aptly Lutheran portrays Borachio, a henchman to Don John. His scenes are extraordinarily well-played and he performs them with a rich use of physical comedy and excellent command of the language. In any other production, Lutheran should play Borachio and only Borachio; he’s that good in that role. Like Benedick, Evan Sanderson’s Claudio also enjoys the humor and slapstick of his role a bit too much for my tastes. Sanderson seems almost too dynamic for Claudio, who falls almost instantly in love with Hero (played by no fewer than five actors at various points in the production). Sanderson reaches his acme late in the second act (Acts 4 and 5 for the academics) when his command of Claudio’s pathos is riveting and he uses this energy to propel his character through the end of the show. Sanderson’s Dogberry, meanwhile, is a delight from his first moment onstage. Dressed similar to a postal carrier, he instantly had my support and attention and his charm and brashness is ideal for the role. While Sanderson has fleeting moments as a Claudio with passion and drive, his real successes are his moments as Dogberry. But the reason I went to this show was Sierra Kagen and, as usual, she does not disappoint. When I first read her roles in this production, I was disappointed, but she shines by making the most of her array of characters. Her Leonato is warm and inviting, while achieving a deep level of scorn and sadness in the later acts. Her Conrad is perfectly suited to Castroverde’s Don John, and their scenes are marvelous. Her Margaret is unforgettable and zany. But, surprisingly, Kagen’s highlight is her role as Hero. As previously mentioned, all five actors, plus a mannequin, play Hero throughout the play. Kagen gets the best scenes, thankfully. Her Hero has the wonderfully fun scene with Ursula (Margaret is absent, obviously) where they not so secretly try to trick Beatrice into falling in love with Benedick. Adam Kassim as Ursula, the flamboyantly, re-imagined friend of Hero, shines in this scene with Kagen. Kagen and Kassim have sharp dialogue, glowing chemistry, and fun pacing to make the scene a delight to watch. Kassim also tackles the forgettable Don Pedro with excellent class and charm; he hits the right notes and helps feature his fellow actors in a selfless way. This maturity and skill is admirable in a young actor, especially in a Shakespearean comedy. The standout skill and passion of the production lies with the director, Daniel Morris. He’s constructed a marvelous retelling and adaptation of this classic comedy while preserving the story. His strengths lie in his emphasis on the fun and joyful tale of love and its many splendors. You can’t help but smile and beam at the ending; it’s pitch-perfect. He has infused so much of modern culture and humor into the production that any audience member can follow the Shakespearean language. The dances and songs are wonderful additions, expertly developed by music director Rebekah Mardeson and choreographer Crystal Lisbon. While the production does run long at two-and-a-half hours, the play wizzes along at a perfect pace. Are there moments that could be fleshed out? Yes, but the captivation and commitment from this talented crew of actors more than compensates for any of these moments. William Shakespeare’s Much Ado About Nothing . . . With a Twist runs at the Boston Center for the Arts until May 13. Don’t miss the magic and charm of falling in love with this talented cast and crew as they re-imagine one of the Bard’s most beloved comedies.